What is Kombucha? Learn About the "Elixir of Immortality"
What is kombucha? Kombucha (or “Bucha”) is a variety of lightly effervescent, tangy, fermented tea that has been consumed for over 2,000 years for its many health benefits. Named the “Elixir of Life,” it is typically served cold and used medicinally. A small glass every day or two is ideal to really feel it’s positive effects. Growing in popularity, it is common to find commercially brewed kombucha in health stores using organic ingredients and flavored with a variety of fruits, herbs and vegetables. There is a lot of uncertainty as to the origins of kombucha but many believe that it has been traced back to Northeastern China in 221 BC during the Tsin Dynasty. It was initially coveted for its healing properties and called the “Elixir of Life,” and consumed by young and old, rich and poor. It’s name is said to be derived from a Dr. Kombu, a Korean physician who brought kombucha to Japan. Eventually the tea was brought to Europe as a result of trade route expansions and became popular in Russia (as “Kambucha”) and Germany (as “Kombuchaschwamm”). In the early 1990’s kombucha’s popularity in the North American markets grew substantially and while relatively still unknown, it was consumed by fermentation enthusiasts, DIYers, back to nature communities. Wherever it traveled to, kombucha was getting a reputation for curing problems with digestion (everything from hemorrhoids to constipation) to rheumatism. Fast forward to today where kombucha can be found in most health food stores, grocery stores, yoga studios and breweries. This once unknown health drink is now gaining popularity and many are deciding that they can brew it themselves at home. This evolving need is the foundation of which Brew Your Bucha was born. One of kombucha’s most important health benefits is its ability to detoxify the body using antioxidants. The various enzymes and bacterial acids naturally produced in the body, used to detox the system are found in kombucha. The high levels of Glucaric acid have been shown to help prevent cancer and is highly beneficial to the liver. Kombucha is a good source of glucosamine, which is often recommended for joint health and to alleviate joint pain. Glucosamine naturally increases hyaluronic acid in the body and helps protect and lubricate the joints. Many athletes swear by kombucha to help repair tissue, especially in the knees which can wear over time. Give your body additional immune system support by drinking kombucha on a regular basis. It contains a compound called D-saccharic acid-1,4-lactone (or DSL) which is antioxidant rich and also helps to improve your energy levels. You can also infuse herbs like tumeric or ginger which have proven to improve immunity as well. Kombucha is perfect for anyone who loves fizzy sodas but can not have high sugar levels in their diet. Properly made kombucha is naturally carbonated and contains minimal residual sugar. In fact, kombucha has been said to manage type 2 diabetes by slowing down the digestion of carbs, which reduces blood sugar levels. Kombucha is a probiotic beverage proven to aid your digestive system by regulating the balance of “good bacteria” in your gut. Studies show that the balance or imbalance of bacteria is directly linked to overall health and disease. Regular use of probiotics improve many aspects of health, including proper digestion, inflammation and weight loss. Our brains are linked to the function of our digestive system. Kombucha contains vitamin B12, which is known to increase energy levels and contribute to overall mental well being. Kombucha’s ability to control the communication of the gut to brain dynamic prevents or minimizes the effects of anxiety and depression. Steep black or green tea in a brewing vessel and add sugar. 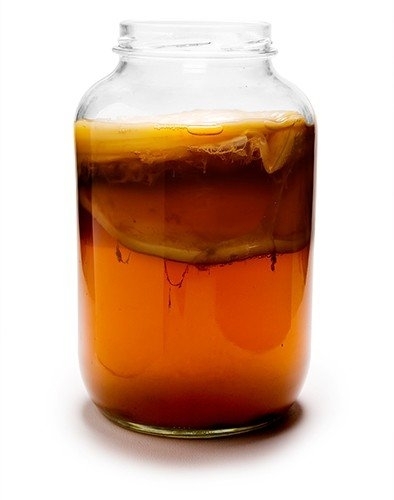 Sweet tea is the "food" for the kombucha culture known as a SCOBY. Allow your sweet tea to cool to the proper brewing temperature. This ensures that culture is not harmed in the process. Place your kombucha culture called a SCOBY (Symbiotic Culture of Bacteria and Yeast) to your sweet tea and leave for 7 days. Bottle the brew and leave for 2-3 days at room temperature. This stage of the process is where carbonation is formed. After refrigerating your kombucha, you are now able to serve it to your friends and family!